This is our second episode, of what looks like will be five, detailing the naval action at Jutland. Last episode we discussed some of the early operations at sea in 1916 and also discussed the state of mind of the British and German navies in the run up to the battle. This episode sees the beginning of the action. First we will talk about how the two fleets got from their anchorages of Wilhelmshaven, Scapa Flow, and the Firth of Forth. Then we will look at the first clash of the day between the battlecruisers led by Beatty and Hipper. The actions of the battlecruisers, not all of which we will cover today, would end up being the most damaging period of the battle for both sides as the two sets of battlecruisers just beat on each other for several hours while first moving to the south and then to the north. One thing to keep in mind during all of this conflict was that these ships are miles and miles apart for most of the battle. This meant that as the distance changed between the lines there was a constant process of adjusting the targeting on the ships, often trying to hit ships that were just on the edge of visual range, especially later in the fighting when fog starts to play a serious factor. Also, another piece to keep in mind, something that I often have to remind myself of is that these ships were designed to take punishment, they had armor of varying thicknesses and strengths, but the entire ship was designed to be hit by the shells of the enemy time and time again. We will first discuss how the Germans got to Jutland. On the night of the 30th of May Scheer sent a message to the fleet, and to the German ships based in Flanders. The message was "31 GG 2490" which meant that the operation that Scheer had been planning was a go for the next day. Just before 10AM Scheer sent a further message to his fleet to concentrate in the Outer Jade by 7PM. The Germans were brining with them a total of 16 dreadnoughts, 6 pre-dreadnoughts, 5 battlecruisers, 11 light cruisers, and 61 destroyers. The part of these ships that was under the command of Hipper consisted of 6 battlecruisers, 5 light cruisers, and 30 destroyers. By the time the German ships were leaving port there were already problems for the Germans that Scheer would not know about until after the battle. The most important of these problems was that the submarine force that he had sent to ambush the British ships on their way to battle had completely failed to do anything. Scheer also made two important decisions before his ships left port that would have ramifications later. The first was that Scheer decided that the Zeppelin scouting was just not going to work due to the weather conditions. This was mostly a decision forced upon him by the prevailing conditions that the time. The second decision was something that Scheer decided on his own, and that was to bring the 2nd Battle Squadron with the rest of the fleet. 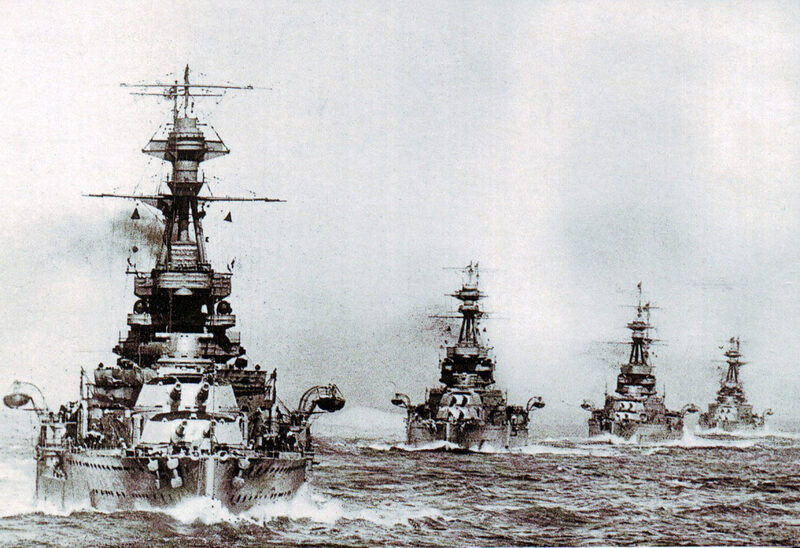 The 2nd Battle Squadron consisted of 6 pre-dreadnoughts. These ships only had 4 12 inch guns, which was bad and severely limited their usefulness, but what was even worse was the fact that they could only make 18 knots, far below the fleet speed of the rest of the High Seas Fleet, and even further below the fleet speed for the British. You may remember that it was the inclusion of the Blucher, an old and slow battlecruiser at the battle of Dogger Bank that had cost the Germans the Blucher, and almost cost them the rest of the fleet of battlecruisers. You would think that they would have learned, but they did not. As it was the entire German fleet was not constrained to 18 knots and while having a few more guns probably made all the Germans feel good the ships probably would not have been worth much in the fight and it is difficult to see how they could have been used advantageously. This was known at the time as well, with them being nicknamed 5 minute ships, because that is how long they were expected to last in a major fleet action. The first people to know of the German fleet's planned movements, maybe before some of the German captains themselves, was the British intelligence officers of Room 40. They had already deciphered all of the messages that had been sent out about the U-Boats and on May 30th they also received the signal that Scheer sent to the ships of his fleet, this was the 21 GG 2490 order. They were not 100 percent sure what this actually meant, but they assumed that it was something. What clued them into the fact that it related to the German fleet moving out to sea was all of the other signals that were sent to German ground stations and to other ships with location and progress reports. All of these things put together meant that it was almost certain that the High Seas Fleet was leaving its protected ports. The news of this reached Jellicoe at Scapa Flow at about noon on the 30th, just 2 hours after it had been broadcast and just a few hours later the order was sent to the ships to provision and prepare for action. This resulted in a massive number of flag signals sent between the British ships and a mad dash between ships and the shore to get men on board their proper ships. As each ships was prepared for departure they would then raise the signal for Ready to Proceed to let Jellicoe know who was ready to go. Jellicoe sent out the normal orders to the fleet before departure, one of which was that they would maintain radio silence unless and enemy was sighted or he himself sent the ships a signal. As fate would have it, the British would leave their port before the Germans would. As they moved out of Scapa Flow signals were sent ahead and the anti-submarine nets were pulled back to let them through but they would be missing one ship and that was the aircraft carrier Campania. The carrier had been anchored away from the other ships behind an island and did not receive the orders. By 10:30PM the Grand Fleet was on its way toward Jutland with three distinct groups of ships preparing to converge with Jellicoe's ships steaming from Scapa Flow and Cromarty and Beatty coming out of the Firth of Forth. The orders given to Beatty were as follows: he was to move to a point 100 miles north of Horns Reef with the goal of arriving by 2PM. If by that point he had not found the enemy, he would steer towards Jellicoe's location and get with visual range at which point further plans could be developed on the spot. They would form into two groups one comprised of 24 dreadnoughts, 3 battlecruisers, 8 armored cruisers, and 47 destroyers and Beatty with 6 battlecruisers, 4 dreadnoughts, and several destroyers. The British would have a considerable numerical advantage in the coming confrontation with the dreadnoughts being 28 to 16, the battlecruisers 9 to 5 and then the lighter ships being 113 to 72. The British guns were also larger with 160 guns larger than 13.5 inches while the largest German guns were just 12 inches. As these ships left port they all managed to get past the German submarines without any problems, although there were many false submarine sightings. At this point the warships were very concerned about submarines because the only real countermeasure to a submerged submarine was to turn away and go to full speed to outrun their slow underwater speed. This concern, and this countermeasure would have an effect on Jutland several times. As it was, the British ships all sailed eastward and Beatty arrived at his assigned destination at 2PM and he began to give the order to turn north to rendezvous with Jellicoe, the German ships nowhere to be seen. After the first signal was sent to Jellicoe, and proceeding throughout the rest of the battle, he was constantly getting updates from the Admiralty based on information from Room 40. This was the British using their ability to intercept any wireless message, and to generally pinpoint its location to a reasonable degree of accuracy. However, what they had for information was not always correct, or at least it was not always interpreted correctly. Part of this was simple confusion on the British side, some of it was purposeful deception by the Germans. As an example, when Scheer left port he transferred his call-sign to a shore station, which would continue to broadcast certain pieces of information under that call-sign. This was done for major ships like the German Flagship, since it would never really leave the fleet it would be easy to tell where the fleet was. The move of the call-sign to the shore station had been Scheer's practice since he took command, believing that it provided him with a small advantage. There had been some initial confusion on the British side, but by the time of Jutland they had it pretty much sorted out and knew that Scheer would choose another call-sign when he left port. This did not prevent it from causing confusion on May the 30th though, specifically when the Director of the Operations Division of the Admiralty, Captain Thomas Jackson came into Room 40 and asked where DK was, DK being the call-sign of Scheer's ship. One of the officer in Room 40 answered that it was still in port, he had been asked a simple question and he gave a simple answer. What the officer could not know was that Jackson did not care where DK was, it cared where the High Seas Fleet was, but since he did not know that the two could be in different places a message was sent to Jellicoe that read “No definite news of the enemy. They made all preparations for sailing early this morning. It was thought the fleet had sailed but directional wireless placed the flagship in the Jade at 11.10 a.m. GMT. Apparently they have been unable to carry out airship reconnaissance which has delayed them.” This was the seed, along with other messages that would prove to be false, that would cause Jellicoe to lose all faith in the messages and information sent from the Admiralty. He did not know how or why it was so incorrect, but he knew that shortly after the message arrived at 4:45PM Beatty was signaling him that he was within sight of the High Seas fleet, indeed he was being fired at by the German ships. This obviously directly contradicted the message from England. There would be consequences of Jellicoe losing faith in the information received, especially during the forthcoming night action when the Admiralty would actually be sending him correct information which he would then not believe. But we are getting a bit ahead of ourselves. When the message was received, and before Beatty contradicted it, Jellicoe believed that the most his ships would encounter were the battlecruisers under Hipper and Beatty, augmented by the Queen Elizabeths, should have more than enough firepower to handle them easily. So Jellicoe maintained his fleet speed on what looked like another leisurely voyage into the north sea. At 2:10PM Beatty went ahead and hoisted up the flag signal alerting his ships that the turn north towards Jellicoe was imminent. At 2:15 he brought the signal down, which was the typical signal that the other ships should then execute the turn. Ahead of Beatty the light cruiser Galatea was still sailing south. Of the light cruiser scouts that Beatty had under his command Galatea was the furthest south and as such found it difficult to see the signal. Because of this difficulty for a few minutes the Galatea continued on course until a lookout saw ships to the south. 8 miles to the south of the Britiish ship there was a plume of smoke that could easily be seen in the afternoon sun. At that distance the Galatea could not see the ship that was causing the smoke, only the smoke itself, so the captain took it on himself to continue south to get visual confirmation. Just a few minutes later the Galatea raised the signal "Enemy in sight" and broke radio silence. "Urgent. Two cruisers, probably hostile, in sight bearing ESE" The first shots of the battle would then be fired at 2:28PM when the Galatea shot her 6 inch guns at the German ships. Things started to progress extremely quickly after about 2:25PM. Over the next 10 minutes several things happened. A German destroyers reported the sighting of the British ships in grid square 164 on the German charts. Soon after Hipper turned all of his ships towards the sighting. At 2:30 Evan-Thomas turned to the north, in accordance with the previous signal from Beatty. At 2:32 the Galatea came under fire from the German cruiser Elbing, at a range of 14,000 yards. Also at 2:32 Hipper went to full speed towards Beatty. Also at 2:32 Beatty ordered his ships to increase speed and turn to the southeast, hoping to get behind the German ships. Beatty even had the Lion's helmsman turn before even waiting for the rest of the ships to acknowledge the signal, not wanting to waste any time. The other battlecruiser captains turns with Beatty, having experienced this type of quick decision before. At 2:35 the Galatea signaled another report "Have sighted large amount of smoke as though from a fleet bearing ENE" This signal was received not just by Beatty but also by Jellicoe, who also went to full speed in order to meet up with Beatty sooner. At 2:37 a shell hit the Galatea for the first time, hitting squarely under the bridge, but not exploding. At 2:38 Beatty ordered all of his ships to go to battlestations, it was not until 2:40 that Evan-Thomas turned his Queen Elizabeths to the south to follow Beatty. Those frantic ten minutes of actions set the stage for the battlecruiser contact. The biggest problem for the British was the distance between Beatty and Evan-Thomas, which was about 10 miles and this would greatly delay Evan-Thomas' ability to contribute early in the fighting. Over the last century there has been quite a bit of discussion about this mistake by Evan-Thomas, I would say that the problem lay with Beatty, who did not follow proper procedure and wait for his signal to be acknowledged. Evan-Thomas was just following the last set of orders that he had been given and, being used to serving under Jellicoe, he knew he was expected to follow orders even if they seemed a bit odd. If he had been more comfortable with Beatty and his style of command he would have known that while Beatty expected his captains to follow orders he also expected them to follow his lead if he made any rash decisions, like turning south quickly after hearing of a sighting of the enemy. For the next 12 minutes Beatty and Hipper continued on their new courses, but importantly Hipper did not know that Beatty was in the area, believing that he was facing just a few British light cruisers. At 3PM Beatty turned his battle cruisers to the east to come around behind the Germans and then he turned northeast ten minutes later. He believed that he was perfectly positioned for an action with Hipper but as it would turn out Hipper was further east than he expected, which meant that he would not be perfectly placed. Remember that this was a time before GPS, which can now give anybody their location to within a few feet, and ships had to rely on proper charting to keep their position. When they got off by a few miles, and then reported the positions of enemy ships those positions would also be off by a few miles. This was just a fact of naval warfare at this time, and it resulted in some ships not being precisely where expected but when you have a bunch of ships travelling over 20 knots for hours at a time there is only a certain level of accuracy that can be expected. When the Germans had been spotted most of the men on the British ships had just started their afternoon tea and as action stations sounded on the ships many of the men grabbed as much food as they could bring with them to their battlestations, especially those who had been in action before. The preparations for battle were carried out on both sides, with fire hoses laid out through the corridors and all the glass removed from exposed windows. This step makes sense, and was another of those small details I had never considered. If you think about it having a bunch of glass, just waiting to be shattered and sent around the ship at high velocity in tiny sharp fragments is a thing you would hope to prevent, and so they did that by taking down all of the windows. This meant thought that the men ono the bridges and in other rooms that looked towards the front of the ship had to put on scarves, greatcoats, and hats to deal with the fact that it was very cold out on the North Sea that day and now they were being hit by wind at over 20 knots. The first battlecruiser to spot the enemy was the New Zealand at 3:15 which spotted five ships on the horizon. At 3:20 the Germans also spotted the British ships at a distance of around 17 miles. At 3:25 Beatty himself sighted the German ships and he increased the fleet speed to 24 knots and kept on his course to the north east. Hipper on the other hand was going 24 knots and decided to hold onto his course that he was on. This would meant that he was headed directly across the British path of advance, which also meant that he was heading away from Scheer. Beatty then ordered a turn to go directly east at 3:30. When this order was hoisted Evan-Thomas missed the order to turn, as he was so far away it was difficult to read any signals and this meant that Evan-Thomas again continued on a previous course rather than adjusting to Beatty's heading. He continued to the northeast at 25 knots for a few minutes before finally turning east, again widening the space between Beatty and Evan-Thomas. The real problem was that during this time Beatty had ordered another course correct to the East South East, and this broke all contact between the two groups of British ships, and it would also be the last time they would be in contact for several hours. Now Beatty was alone with his six battlecruisers against Hipper, which should have been okay, they still outnumbered the Germans. The reason that Beatty had tuned to the east south east was to try and get out of the smoke that his own ships were causing, with the wind blowing the smoke of the ship in front onto the ship behind. At 3:46 Beatty sent his battle orders to his ships, the first 2 ships were to concentrate on the first ship of the German line and then each ship would focus on the next ship in line, this is identical to the setup that had been ordered at Dogger Bank. On Hipper's side, he ordered his ships to hold course and slowly close with the British and also changed his speed to 18 knots to allow his ships to close up. This would be the situation when the two fleets met. Just one more word on Evan-Thomas here, if his positioning would have been intentional it was actually brilliant because Hipper believed that he could beat the British, even down one ship, so he welcomed the fight with the knowledge that Scheer would be coming. This could have let Evan-Thomas get in position to ambush Hipper and his ships after the fighting had started. If Evan-Thomas would have stayed with Beatty the entire time Hipper might have just run south at top speed immediately, seeing that he was too far outnumbered which would have maybe made the battle of Jutland not even happen. As the ships moved into position to begin firing lets leave them to go back to Jellicoe. He was 65 miles to the north as Beatty closed in with Hipper and he had not had a proper report from Beatty since the original sighting by the Galatea he just had no idea what was going on. All he knew was that the Admiralty was telling him that the High Seas Fleet was still in port, and so Beatty should be okay so he continued south at a leisurely 17 knots until another report came in from the Galatea that there were now multiple large smoke clouds, which was indicative of the German battlecruisers which caused Jellicoe to speed up. At this point you can sort of lay out the positioning of the various fleets as this, Jellicoe was the furthest north, then 55 miles south there is Evan-Thomas, then another 10 miles you have Beatty, then you had Hipper, then 50 miles to the south there was Scheer. They were not in a direct line north to south but they were all steaming together at various speeds and everybody was ready for action. Beatty assumed that Hipper was alone, but he knew he had Jellicoe and Evan-Thomas to back him up. Hipper thought Beatty was alone, but he knew he had Scheer to back him up. At 3:48 Hipper signaled to his ships to open fire at a range of 16,500 yards. 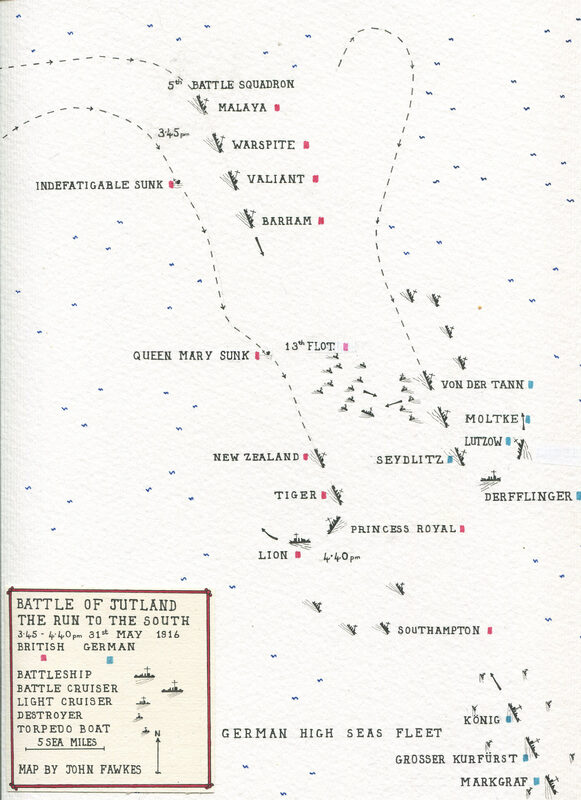 When I talked about the phases of the battle in the first episode I mentioned that one of the phases was the un to the south, we have finally reached it, the first phase of the battle of Jutland as the British chased the German battlecruisers. The two lines of ships were travelling on a southeastern course and they were both firing. On the German side they very quickly got the range of the British ships, with the first salvos falling within 200 yards and further shooting walking the shells in. After a few volleys they began to register hits. The German plan was to have each ship fire at the British ship that was the same spot in the line then the last German ships, the Von der Tann would split its fire over the final two British ships the Indefatigable and the New Zealand. The splitting of the first of Von der Tann was obviously not ideal but it was considered to be necessary to keep each ship of the enemy under some sort of fire, even if it was only half the batteries of a ship. This was a great plan, and much like many great plans, it did not happen that way as the Von Der Tann focused all of her guns at the indefatigable, leaving the New Zealand free to fire without interruption. On the British side they were having similar issue, but much closer to the front of the line. Beatty wanted the Lion and the Princess Royal, the first two British ships, to fire at the Lutzow while the Queen Mary engaged the second German ship, the Derfflinger, however this did not happen and the Queen Mary focused on the Seydlitz, leaving the Derfflinger in the clear. This was very bad for the British, but it does give us one of the better accounts of the fighting from George von Hase, the gunnery officer for the Derfflinger. He records that the Germans had the advantage of the light, which was behind them, and they also had far less smoke along their line. The British had the wind in such a position that it was covering all but the Lion at the front. The firing began at 3:48 and would continue at top rate for the next 20 minutes. So while I am talking about the next set of fleet maneuvers and shells hitting remember that all 11 ships were, for the most part, firing for all they were worth at the enemy the entire time. I don't want it to sound like I am doing a play by play of the action, that would involve going far more in depth than I think is warranted for our podcast. About 4 minutes after the firing started the Germans started laying down hits on the British line, the Lion was hit twice, the Prince Royal 3 times, the Tiger 3 times as well. On the bridge of the Lutzow Hipper was probably very pleased with these results. One of his officers would recount about this time that "His unruffled calm communicated itself . . . to all those on the bridge. Work was carried on exactly as it had been in peacetime maneuvers.” Another officer reported that Hipper “could not be separated from the telescope. There was nothing which escaped him, nothing he forgot, and he personally issued orders even on matters of detail. Just before fire opened, the First Staff Officer and the Gunnery Officer were discussing the unfavorable fire distribution. Hipper intervened with the remark that this was his business. No one need worry about it." Hase from the Defflinger would record about this time that "With each salvo fired by the enemy, I was able to see distinctly four or five shells coming through the air. They looked like elongated black spots. Gradually, they grew bigger and then—crash—they were here! They exploded on striking the water or the ship with a terrific roar. Each salvo fired by the enemy raised colossal splashes. Some of these columns of water were of a poisonous yellow-green tinge . . . these would be lyddite shells." At 3:54 the range between the two lines was down to 13,000 yards which meant that the ship's secondary batteries were able to be used as well and they registered many hits on both sides, but do not seem to have caused any major damage. As the distance closed the firing on both sides became more and more effective with the Germans getting the better of it. The difference became so pronounced that Beatty, seeing how much better the Germans were doing, had to turn his ships away. As the turn was executed the Queen Mary was able to hit the Seydlitz with a shell right on the C turret, which caused a huge explosion that ignited powder bags in the turret and the heat and shockwave of the explosion killed almost the entire crew of the turret. This reduced the fighting power of the Seydlitz but did not bring her out of the line. The Tiger was taking a beating on the British side and was hit 5 times in just seven minutes. At 4PM a shell, fired from the Lutzow penetrated the Q turret and killed all but 2 men in the turret instantly, both of them were mortally wounded. With near his dying breath Major Harvey called down the voice pipe and ordered the flooding of the magazine, an action for which he would be awarded the Victoria Cross for saving the ship. 70 men had been lost in the turret, but because the sheet of flame that raced down the powder hoist was stopped by Harvey's action the explosive power went out the top of the turret, surely an impressive sight, and clearly a problem for the Lion, but the fireworks were more impressive than the actual damage and the Lion was also able to stay in the fight. While the range lengthened between the two lines the Germans continued to register hits. At 4:04 the Von Der Tann landed 3 hits on the Indefatigable all three of them hitting the same turret. The third one would penetrate. The explosion ignited the powder bags that then sent the same sheet of flame down into the magazine as had happened on the Lion but here there was nobody alive to get the firedoor closed or to flood the magazine. When the fire hit the magazine a giant explosion rocked the ship. Here is the account of the officer on the bridge of the New Zealand, one ship ahead of the Indefatigable. "We were altering course to port at the time and it seemed as if her steering was damaged as she did not follow around in our wake but held on until she was about five hundred yards on our starboard quarter. While we were still looking at her, she was hit again by two shells, one on the forecastle and one on the fore turret. Both shells appeared to explode on impact. There was an interval of about thirty seconds and then the ship completely blew up. The main explosion started with sheets of flame, followed immediately by a dense dark smoke cloud which obscured the ship from view. All sorts of stuff was blown into the air, a fifty foot picket boat being blown up about two hundred feet, apparently intact though upside down." In just a few minutes the ship capsized and sank. Out of the 1017 men on board only 2 survived to be picked up by a German destroyer several hours later. The distance between the two lines of ships continued to lengthen and eventually the fire died down. On the Lion Beatty was unable to communicate through wireless, because his transmitter had been knocked out and he was forced to relay orders by flag to the Princess Royal. For the British the situation was looking dire, already losing a ship, but now Beatty would be assisted by Evan-Thomas, who was about to arrive with their 40 15 inch guns.